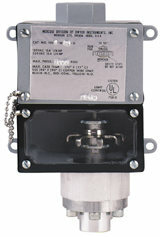 Same rugged construction as used in Model 1000W plus explosion-proof design are combined in this new unit. UL listed for Class I, Groups A, B, C & D; Class II, Groups E, F, & G. Bellville Spring Movement permits mounting of control in any position and helps prevent contact chatter. High over-pressure protection and vibration resistance are also featured.